Sprawling 50-acre Beattie Park lies against the foothills of the City and offers fantastic views of the Lompoc Valley. On a clear day, from the highest point in the park, you can easily see the Pacific Ocean! Beattie features a disc golf course and horseshoe pits, a large group picnic area, children’s playground, two lighted basketball courts, a multipurpose soccer/football field, individual picnic areas, an urban forest preserve which has a popular winding fitness trail, and “Lookout Point” located at the highest point in the park. Uncrowded back roads. Rolling hills and farmland. Historic neighborhoods. The Lompoc Valley is beautiful place to explore by bike, with rides and roads ranging from flat to hilly. The Beattie Park Disc Golf Course is an 18-hole course for players of all skill levels. The front 9 is grassy and open. The back 9 is moderate to heavily wooded, with a few tight tunnel shots and two long downhill “Top of the World” shots. Wind and elevation changes add to the challenge! Jalama Beach Park is a 30 minute drive from the city of Lompoc California. On this scenic drive, just outside of city limits, you’ll see working ranches and vineyards along with scenic vistas around every bend. Jalama Beach is a popular place for picnics, surfing, kite surfing, bird watching, nature photography, fishing and camping. Many protected California native plants like sand verbena, saltbush, and sea rocket, grow within park boundaries. Day use is $10 per vehicle. Dogs can enjoy the beach for $3 per dog per day. Campsites start at $30 per night, reservations recommended (see below). The onsite Jalama Beach Grill is open 7 days a week for breakfast, lunch and early dinner. Be sure to try the famous Jalama Burger — some say it’s the best they’ve every tasted! Is it the secret sauce? Just the right seasoning on the meat? The shredded lettuce? Or perhaps the amazing view that makes the Jalama Burger so darn delicious? Come try one, and tell us what you think! Jalama is subject to high winds and rough surf. Lifeguards are on duty during the summer months, however visitors swim at their own risk. Beach Caves can be accessed along the sand – during low tide – about a mile north up the beach. Spend the day at Jalama, then check into one of the nearby Lompoc hotels and motels. While in town you can also enjoy wine tasting, site-seeing in Old Town Lompoc, a skydiving adventure, a tour of La Purisima Mission, and great local restaurants. Small and beautifully designed, Miguelito Park is removed from the city bustle. Kids love the playgrounds; parents love the privacy. Miguelito Creek meanders through the property. The park features group picnic areas, hiking trails, horseshoes and more. From Highway 246 in downtown Lompoc, go 3.5 miles south on “I” Street which becomes Miguelito Road. At first glance, Nojoqui Falls County Park near Lompoc looks like your average city park with sports fields, barbeque grills and group picnic areas. But tucked away toward the back of this park is a local secret – a 100-foot waterfall that tumbles down from high cliffs into a natural pool. Hike the short 15 minute trail to see one of Santa Barbara County’s few year round waterfalls – an easy stroll for all ages. Wind-swept Ocean Beach Park & Estuary is where the Santa Ynez River meets the Pacific blue. 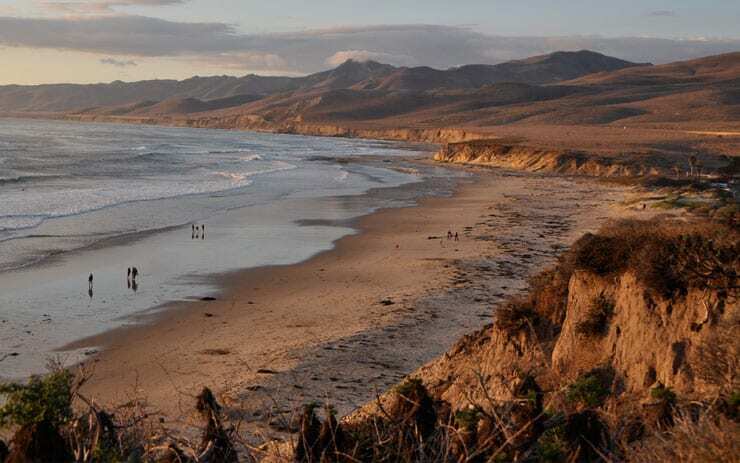 At this pristine location you’ll discover Lompoc’s most engaging and beautiful shoreline. Bird-watchers and nature photographers flock to this destination, where all kinds of migratory sea birds can be seen. Take Highway 246 to the coast, turn right on Ocean Park Road. The park is open year-round – you see the river, estuary and railroad bridge – but access to the beach is closed spring and summer for the Snowy Plover nesting season. Please note that access to the beach is closed to the public from March 1 through September 30 due to the Snowy Plover nesting season. Built by community volunteers for BMX and dirt bike enthusiasts, the River Bend Bike Park offers off-road trails and jumps for all levels. Open daily, weather and conditions permitting. On-site restrooms and picnic tables. The unsupervised Bike Park is located at the end of McLaughlin Road in Lompoc.